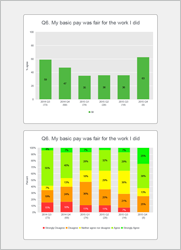 For surveys over multiple time periods, this report shows the trend of each question as a value over time and the distribution of answers over the same time period. Useful for analysis to see the single trend value with underlying details. Word outputs are formatted as two charts per page. Excel outputs have a tab for each topic or page. Web reports are continuous. PowerPoint and PNG formats are single chart per page. TIP: In a wide browser, or smaller magnification, charts appear side by side.